Stratechery is not a political blog, and this is not a political post. Rather, my focus is the business and strategy of technology, something that is inextricably linked with the effect technological change has and will have on society broadly — and that includes politics. We argued that the leaders of party coalitions have great influence over the selection of a presidential nominee. Before [we wrote The Party Decides], the conventional wisdom was that such broad and diverse coalitions of politicians, activists and interest groups within parties were largely shut out of the nominating process by primaries and caucuses in the 1970s. This led to a free-for-all among narrowly factional candidates. In 1976, Jimmy Carter emerged from a crowded field to win the nomination despite having no connections to most leaders in the national party. This year’s election has not followed our script. 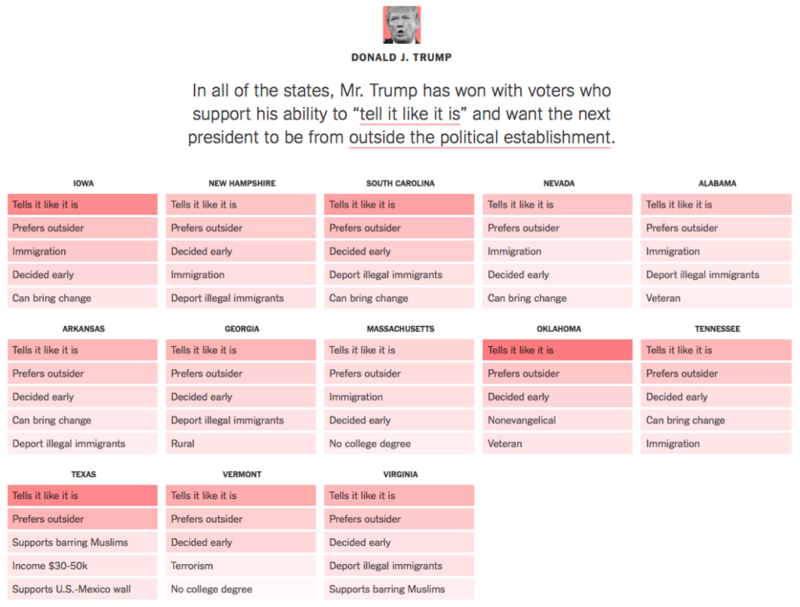 Mr. Trump is the clear front-runner, but is loathed by the party establishment. I think Noel’s scope is too narrow: politics is just the latest industry to be transformed by the Internet. Social media is breaking the political ‘Overton Window’ — the ability of elites to determine the outside edges of acceptable conversation (link). These limits were enforced by party discipline, and mass media whose economics meant political centrism was the best way to make money (link). This was BC: Before Cable. One or two newspapers per town, three TV stations; all centrist, white, pro-business, respectful of authority (link). Cable changed things, allowing outsiders to campaign more easily. In ’92, Ross Perot, 3rd party candidate, campaigned through infomercials (link). After Cable but Before Web lasted only a dozen years. Cable added a new stream of media access. The web added a torrent (link). This started with Howard Dean (the OG) in ’03. Poverty was the mother of invention; Dean didn’t have enough $ to buy ads, even on cable (link) but his team had Meetup & blogs… (link). After webifying Perot’s media tactics, Dean pioneered online fundraising. Unfortunately for him, his Get Out The Vote operation didn’t (link). That took Obama. Obama was less of an outsider than Dean (though still regarded as unelectable in ’07) but used most of Dean’s playbook (link). And then there was vote-getting. Facebook and MyBarackObama let the Obama campaign run their own vote-getting machine out of Chicago (link). Long-time readers should recognize the tell-tale signs of Aggregation Theory. Previously newspapers integrated editorial and advertising copy into a bundle that was delivered to a geographically captive audience. Said newspapers’ market dominance was secured by their control of production and distribution, but their growth was capped by the challenges of scaling said production and distribution beyond said geographic area. Facebook (like Google before it) built a powerful relationship directly with users by delivering content users cared the most about. This, then, made Facebook the front door to the Internet for most users. There certainly is room for all the ads: thanks to the Internet reality of zero distribution costs and zero transaction costs, an aggregator can scale nearly perfectly to effectively every user on Earth, as we’ve seen with Google, Facebook, Amazon, and increasingly Netflix and Uber. For a moment, though, step back to the world as it was: the one where newspapers (and TV stations, etc.) were gatekeepers thanks to their ownership of production and distribution. In this world any viable political campaign had to play nicely with those who ran the press in the hopes of gaining positive earned media, endorsements, etc. Just as important, though, was the need to buy advertising, as that was the only way to reach voters at scale. And advertising required lots of money, which meant donors. And then, once the actual election rolled around, a campaign needed an effective GOTV effort, which took not only money but also the sort of manpower that could only be rustled up by organizations like labor unions, churches, etc. Why tie parties so closely to party leadership as such? Why not view parties as larger coalitions that include not only top leaders but activists, fund-raisers, interest groups, campaign technicians, and others? Certainly the larger set of actors has great influence on party behavior. We therefore propose to theorize parties, and to study them in practice, as coalitions of the larger set of actors. Politicians will be important but not necessarily dominant; interest groups, activists, and other policy demanders will be permitted large roles in party decisions. Our theory will focus on why diverse political actors might attempt to form parties and what kinds of candidates they might seek to nominate. It is natural to think of parties in a two-party system as majoritarian. Ours, however, are not. They want to win elections, but they do not necessarily wish to represent a majority of voters. As a by-product of their wish to govern, parties must offer a degree — perhaps a large degree — of responsiveness to popular majorities, but responsiveness to voters is not why parties exist. They exist to achieve the intense policy demands of their constituent groups. One might criticize parties for lack of deference to majority will, but their groups would not much care. Intense policy demanders nearly always believe their demands are just and that it is their duty to work for these demands whether or not most voters agree with them. To summarize: parties are not just politicians, but coalitions of actors who care intensely about certain policy outcomes. These actors work together to get politicians elected who will serve their interests; voter interests are a means, not an ends. And, according to Noel and company, such parties succeed because they control all of the apparatus necessary to win elections. This brings us back to today’s world, and admittedly, the leap from a description of Facebook and Aggregation Theory to politics is not an obvious one: I’m not proposing that Donald Trump or anyone else is an aggregator. Indeed, given their power over what users see Facebook could, if it chose, be the most potent political force in the world. Until, of course, said meddling was uncovered, at which point the service, having so significantly betrayed trust, would lose a substantial number of users and thus its lucrative and privileged place in advertising, leading to a plunge in market value. In short, there are no incentives for Facebook to explicitly favor any type of content beyond that which drives deeper engagement; all evidence suggests that is exactly what the service does. This is a big problem for the parties as described in The Party Decides. Remember, in Noel and company’s description party actors care more about their policy preferences than they do voter preferences, but in an aggregated world it is voters aka users who decide which issues get traction and which don’t. And, by extension, the most successful politicians in an aggregated world are not those who serve the party but rather those who tell voters what they most want to hear.